Come and stay in our historic farmhouse. 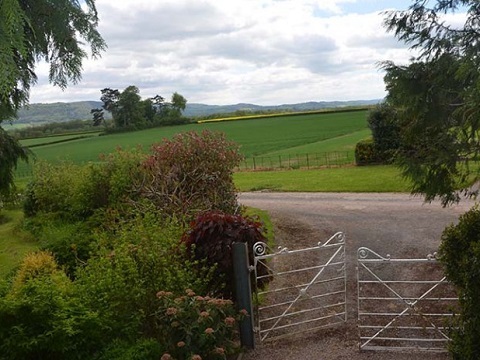 Relax and enjoy the wonderful gardens or enjoy the delights of West Herefordshire. 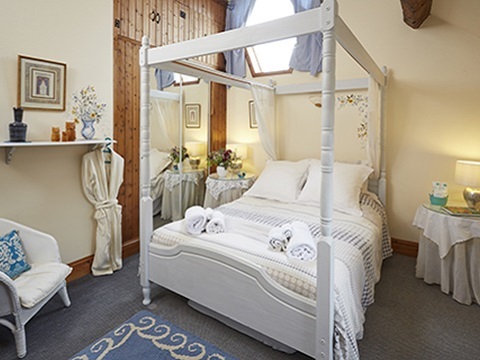 We offer gorgeous accommodation bed and breakfast or as self-catering cottages. Brunches are available by arrangement. There are many places to visit near by and plenty of events to tempt you. We are only 15 minutes from Hay, home of the famous literary festival. As well as running a B&B in Herefordshire Pearl is a professional felt maker. 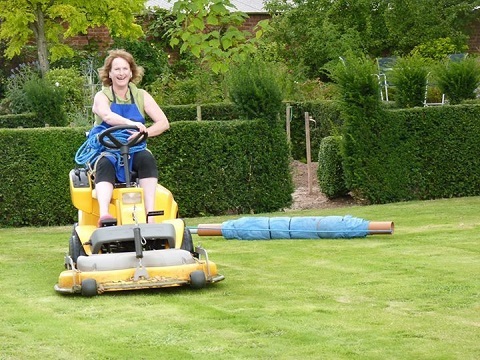 Here she is rolling a raw fleece whilst mowing the lawn. 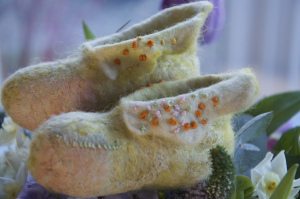 She runs courses in felting at Herefordshire Holidays as well as other venues. The Herefordshire Holidays logo is a pen and ink drawing of Upper Newton Farmhouse by new graduate, graphic illustrator, Brittany Davies. 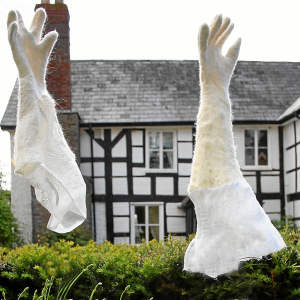 Welcome to Herefordshire Holidays: a business celebrating Herefordshire, gardening, felt-making and great accommodation. Unique in Herefordshire in that even B&B guests have a whole cottage to themselves. Choose to breakfast in your own space or in the Jacobean farmhouse dining room. Enjoy stunning Herefordshire gardens here and locally. The peaceful environment sets us apart from other B&Bs in the Marches area. 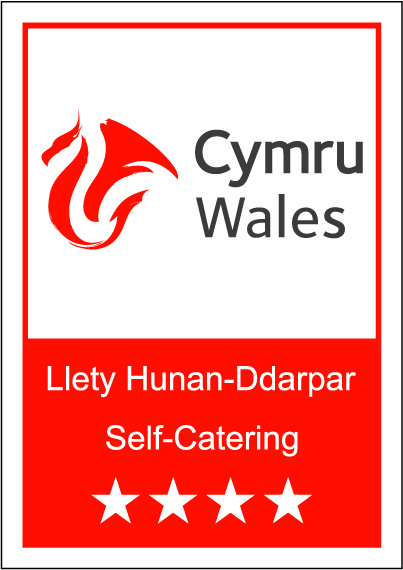 If you need to stopover for business then tasty lunches can be provided to help you through the working day. The small, but perfectly formed meeting room is available free of charge at present. Ssssh When Christopher Somerville (Telegraph) stayed and needed to file a radio report we even managed to still the tractors and ensure the cows were further away and fed and quiet! Special? It is not about occupancy levels and bed night statistics for us! Pick and choose your own vegetables in the cottage vegetable garden. Have a farm tour with the farmer to really understand the countryside. As well as running an award-winning Bed and Breakfast (AA Landlady of the Year), I am a feltmaker and create functional,useful and unique felt items. I enjoy stretching the boundaries of felt-making. Layers of texture and hand-stitching are used to enhance and personalise the work. British fleece and natural fibres are used and, just like the food at Upper Newton, the fleeces are now traceable and support small farmers and breeders. If you would like to explore a new skill and engage with some felt making whilst on your break, please let us know in advance and we will do our best to help. Upper Newton Farmhouse is owned by Jon and Pearl Taylor. Jon runs the farm and is an expert in apples. Pearl runs the B&B and felts and gardens. We have a visitors' book that people are kind enough to write in. Click here to see some of the comments they have made. There are also reviews on tripadvisor. After all the rain yesterday it was lovely to see the silver birches in the low winter sunshine. Last of the Autumn berries and amazing light - on a silk scarf, botanical printing fun. Or you can ring us on (+44)1544 327727.